So, your crystal grid isn’t working? There are a few things that may be interfering with it. Avoid these mistakes and give your crystal grid the best chance to work at its best for you. There are a few reasons your crystal grid isn’t working as well as you would like. We never fully know why this happens with grids, energy healing or manifesting. There are so many factors involved. We can’t control everything and we certainly can’t make things happen faster than they are meant to. Remember divine timing may come into play. There is no set time for crystal grids to work, so make sure you have given it a few months if possible. I have made grids that took a few weeks to over 8 months. I do not personally teach that things have to happen in a set space of time. Each intention, situation and grid is unique. Keep all this in mind, but check you haven’t made any mistakes and see if there are any ways you can help your grid. 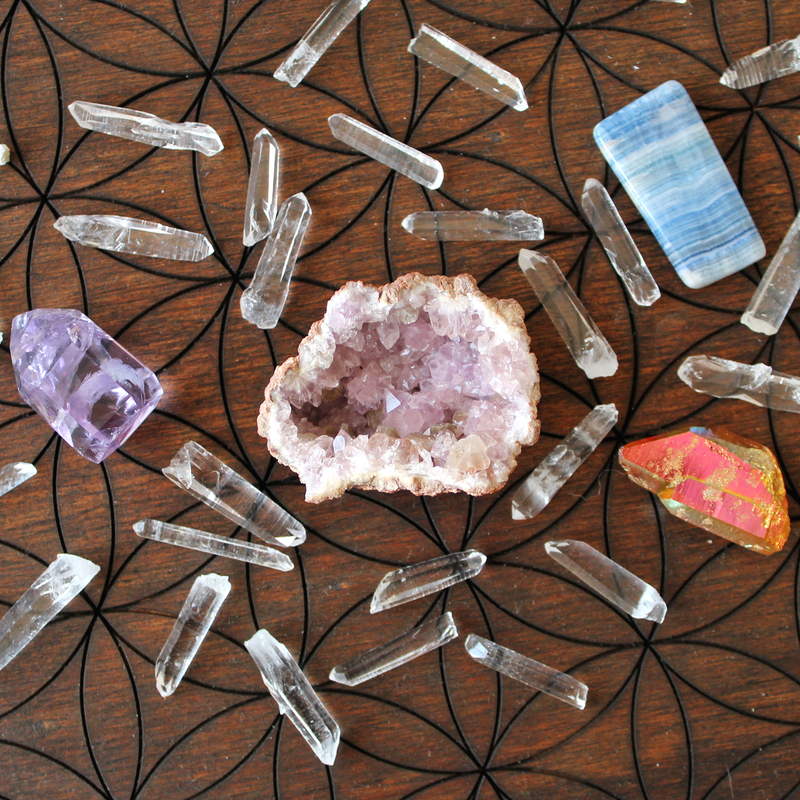 Before we go on, I want to make clear that I work with intention-based crystal grids. Although intuition plays a part in their creation, I do not work with purely intuitive grids or those where all the crystals are picked by intuition alone and not by their known properties. I will assume that you created your grid with a clear intention for its purpose and chose crystals and geometric patterns that match this purpose and support it. If you follow my grid recipes, I always do this for you on my blog and in my books. This is one of the most common reasons your crystal grid isn’t working the way you would like it to. Have a look at where the crystal grid is placed. Is it a messy area? Is there a build up of clutter around it? None of this is helpful to allow the energy of your grid to remain clear and to flow freely. Even other crystals around it that are not related to the grid can sometimes throw the energy off. I also do not advise keeping a grid next to computers, TVs or anything with a strong electromagnetic field. I ignored my own advice with a grid once due to space restrictions and it did not work till I moved it away from the TV… Give your grids space to breathe or consider moving them elsewhere. 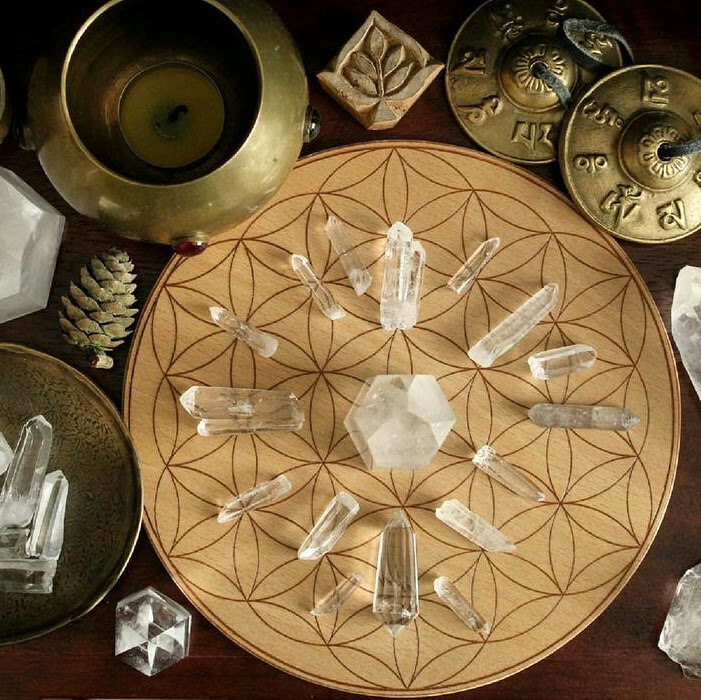 Is your crystal grid surrounded by clutter? Wooden grid base by Fractal Roots Design. I have seen my crystal grids bring results soon after I cleaned them. You can see and feel the difference once you dust the area along with any grid base you used and all the crystals. Another common reason a crystal grid isn’t working as well as it should is that it may need cleansing. I do recommend in my book Crystal Grids Power that you cleanse your grids once a month. 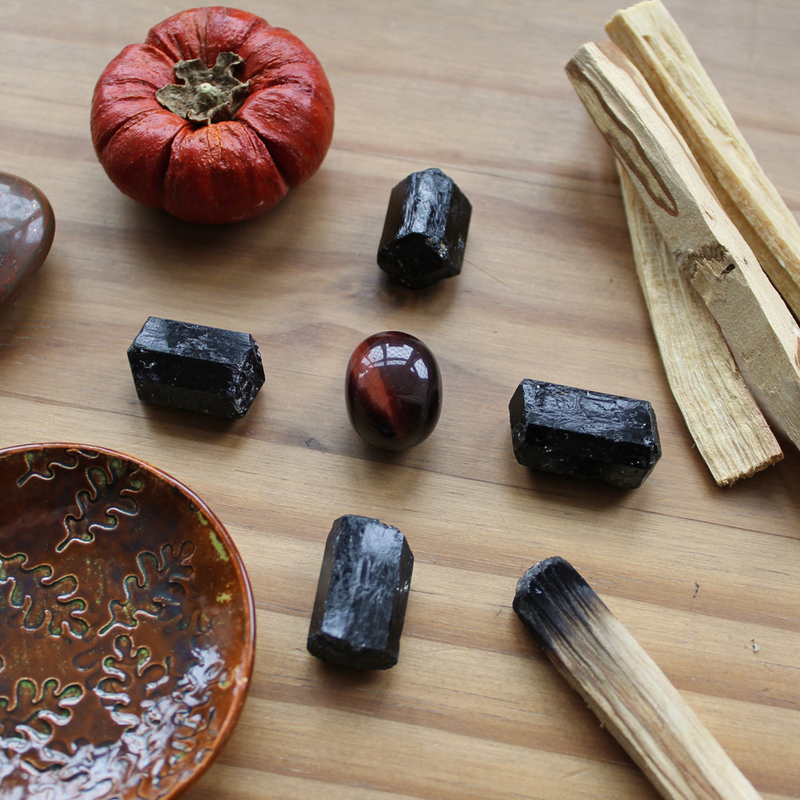 You can use whichever cleansing method you prefer, such as smudging, palo santo, reiki, moonlight etc. You would need to cleanse the crystals and any other parts, including any printed templates or other items in your grid. Afterwards, just rearrange your crystals if you moved them. There is no need to reactivate the grid, your intention remains. For a detailed guide to cleansing grids please read How To Cleanse A Crystal Grid. Crystals help but they don’t do the work for us. Depending on the type of grid you made, is there anything that you should be doing to support the change you want to see? If it was for healing, are you taking care of your health and reducing stress? If it was for prosperity, what are you doing to bring in more money? Want a new job? Are you actively looking and applying for jobs regularly? If your actions do not match what you want to see, then you are sending mixed signals to the Universe and that will likely block you. Only you know what you need to do and only you can do it. Our thoughts affect the world around us and if they are very negative they can block the intention behind your grid. You are linked to the grids you create. If you constantly doubt what you wish to manifest then it has little chance. Make a conscious effort to stop negative thought patterns relating to your intention. Watch a feel-good film, motivational speakers, read a positive thinking book or start using techniques like positive affirmations, tapping or hypnosis. We have so many tools now and if you have an internet connection you can access much of it for free. Books can last a lifetime, invest in yourself if possible. Crystal grids need crystal clear intentions. Wooden Grid base by CopperMoon. Have a really good think about what the intention for your grid was and how you kept this in mind when you activated the grid. If you placed a note under the Central Stone or recorded the details of the grid in a journal then read this again. Make sure your wording is clear, positive and could not mean something else. If you think it could be improved or reworded then make the changes and reactivate your grid. Mental clarity is also important, when you activate your grid take some time to relax and meditate to help clear your mind. Cleansing your aura with a visualisation or working with crystals such as Selenite is also helpful before doing this. I also recommend you cleanse your chakras too. Record the new grid activation date and see it as a new crystal grid and day one. Please keep any questions you have concise and on topic if you want a response. Thank you Ethan for another wonderfully informative blog. I have been wanting to create another grid my intention is set but sadly I have quite a bit of negativity around me right now, but after this article and some further study of your great book soon I think I will have a productive grid. Thank you!! Thanks very much for this post! 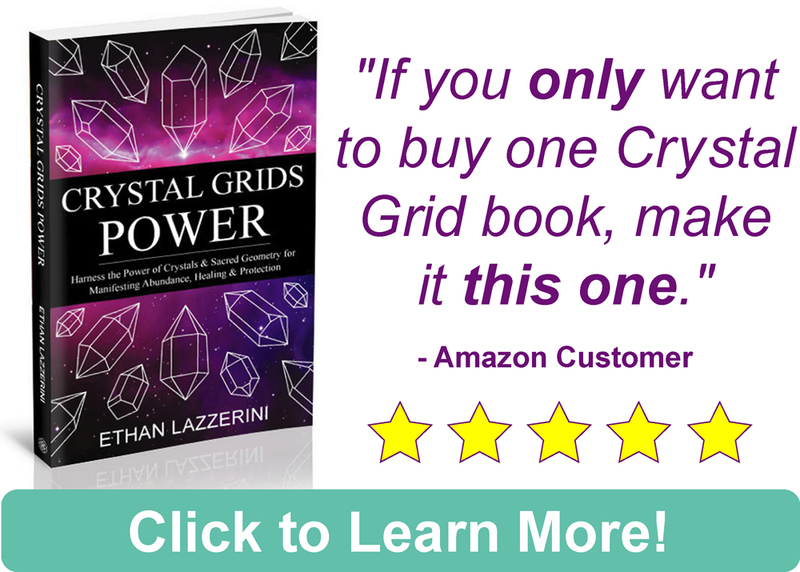 I love your Crystal Grid Power book and am using it much more than other books I have purchased. However, I am confused about the cleansing of the stones vs cleansing of the grid. When I take a grid down and cleanse the stones I use palo santo and the ting shaw chimes but thought that was cleansing them of intention. If I do this for the grid, won’t it remove the intention? Thanks Sage. Normally, cleansing a crystal grid removes negative energies only. It does not remove the positive intention and programming in the crystals (unless you intend it to). You can follow my instructions for deactivation of a grid in my book, but if you are intending/stating your intention to remove the intention behind your grid while cleansing them then that should work too. Hope this makes sense. Hey Ethan! 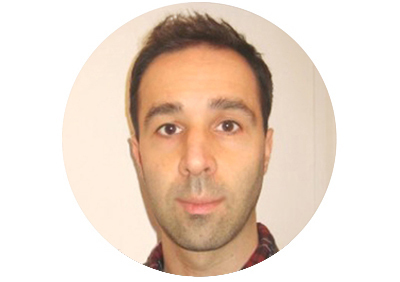 I have just visited this website for the first time and I really love the way it feels. The pics are stunning and the info is helpful and I actually enjoyed looking through. I wanted to know if I can cleanse my crystals in the rain & sure enough you had the answer!!! I’m super excited for tonight’s moon?? Thank you. I will be back. Thank you so much, so glad you have found it helpful 🙂 Happy cleansing! I’m so happy to have found your blog! I have found a wealth of information all in one place, thank you! My fella and I are setting our first grid in our home for protection. Is there a particular time of the moon cycle that would be best? We’ve been told to set it during the full moon. The house is two stories with heaviest activity in the basement. Would you suggest that we set our crystals in the farthest corners of the basement inside, in the corners of each floor or bury them outside on the property line? Hi Aleece, I personally do not wait till a certain moom phase to start my grids (with exception of a New or Full Moon grid). I do them as and when I need them (and they work for me). Some people work with the phases of the Moon so of course, you can do that and it may help you. For positioning house grids it is also personal choice, there is no better way and it depends on your home, what feels right and what works best for you. You can always adjust the grid if you need to later on. Good luck! I would like to know your opinion on this matter. Thank you in advance. It’s hard to say. You can always try it but my issue with electricals is more about the current of energy possibly blocking the energy flow of the grid. Maybe make a grid from Shungite, it’s still a crystal. Otherwise try a regular crystal grid and test it out for yourself. Thank you Ethan. I would try that. Have a great day and Happy New year!!!!! I really enjoyed your article. I did a crystal grid with my husband about a month ago with clear intentions. I used a different book, but found the stones and geometric grid pattern recommended and followed all the steps, many like your own. 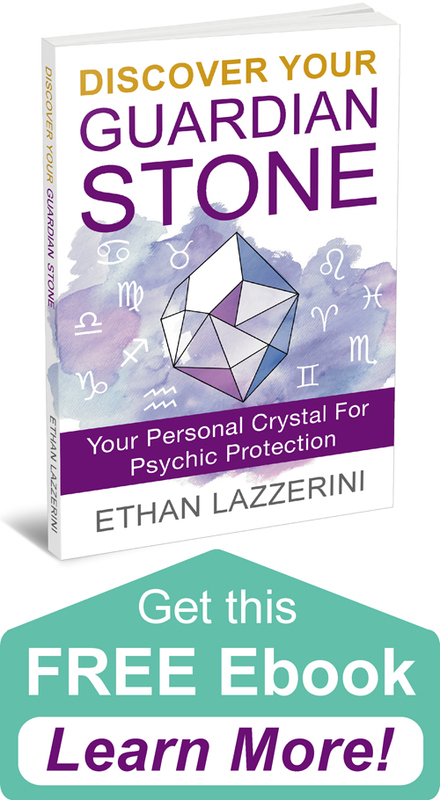 The one difference was that this book mentioned protection stones on the outside of the grid for protection only if I felt I needed it (dispellers & barrier stones of equal amounts). Since there is a lot of negative energy in my house, I added these stones on the outside. After activating the grid with my husband touching me since it was really more for him, we have each individually spent time with grid daily, focusing on the intention (career procurement) that is under the center stone. We saw activity almost immediately but then everything that happens has bizarre ways of falling through. That last one being that his flight to the final interview was delayed and then air traffic control had a fire and the entire airport shut down so he could not make it. All was fine and when they went to reschedule his trip, they changed their mind. This is just one example of at least 6 where he’s been down to the final and bizarre things have happened to deter getting the job. Any thoughts here? Also when I spend time daily with it I will take my tibetan bowl in and play it over the grid and I will also do reiki. I can feel the energy coming off the grid, but when I put my hands over the protection stones I feel a lot of heat. I am curious what that means, if you have any idea? I am thinking they are working hard but am just curious. Also today when I put my hands over it and started to Reiki, I did not feel anything at all for the first time. A crystal store here mentioned putting a piece of selenite by it, but that was not mentioned in my crystal grid book. Any idea why I would not feel anything? Also the grid is in my husband’s home office as that is where he works or applies for jobs. He has been very very busy working full time at finding new employment. Since our internet router is in there, and a tv I am wondering if this could be interfering? Also the grid is on a long stand with a printer on each end, so I’m thinking we need to either move the printers or perhaps move the grid right outside my husband’s office, your thoughts? I would really love to leave it in his office where the kids, friends, and visitors and pets will not bother it, but am not sure how to do that if these other things could be interfering. Thank you. That is a lot of questions and to be honest I don’t comment on grids from other peoples books and feel it is their responsiblity to help with questions about their methods. Saying that, it has only been a month and it really has not had much of a chance. You could try moving it, the purpose in the blog post is for you to test this stuff out yourself. If there is a lot of anxiety, fear or worry around a goal that can delay or reduce results. Crystal grids are just tools, your mindset, energy and actions are just as important.